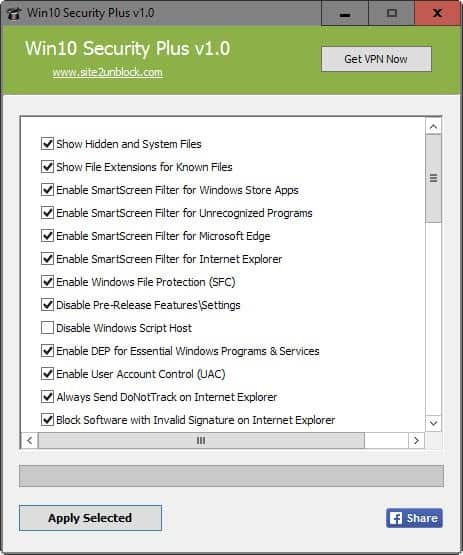 Win10 Security Plus is a free tweak program for Microsoft's Windows operating system that has a strong focus on security modifications. What may be confusing right from the get go is that it is compatible not only with Windows 10, but also previous versions of Windows all the way back down to Windows XP. Win10 Security Plus is a provided as a portable version that you can run from any location you desire after extracting the downloaded archive. The program displays all tweaks in a long list that you need to scroll to go through all of them. Each tweak is listed with its name and a checkbox, with the latter being used to change the state of the setting. While some tweaks are explained by the title, others are not, and that is one of the shortcomings of the program. For instance, what impact do changes to "restrict changes to Base System Objects", "enable DEP for essential Windows programs & services" or "defer Windows upgrades" have? Most items are self-explanatory though, and features range from basic tweaks that you can do easily in Windows as well (show hidden files and folders), to modifying core Windows features such as Windows Update, Remote Registry or Windows Defender. What may be a bit confusing is that a checkmark may indicate that a feature is enabled or disabled, and that this becomes clear only when you read the title. For instance, there are checkmarks in "disable Remote Registry service" and "enable Windows Defender". A checkmark indicates if "what the title mentions" is true or false, and not whether it is enabled or disabled. What's good though is that the program checks the corresponding system settings and features, and either displays a checkmark or not according to those settings. Last but not least, you will notice that you cannot resize the program window to display more tweaks at the same time which means that you will only see part of the tweaks in the interface at all time. The majority of tweaks provided by Win10 Security Plus are valid for all versions of Windows. Once you check or uncheck boxes in the application window and hit apply, you are prompted to create a system restore point. That's useful as it enables you to restore all settings should things turn out wrong. The program prompts you again after making the modifications to reboot the PC to apply the changes. What's missing here is an option to restore settings directly from the program interface. That's not a problem if you can remember the default states of each tweak, but problematic if you don't. Win10 Security Plus is a portable program for Windows that you can run whenever you need to modify the 40 or so settings or features of the operating system. The software has some usability issues that I mentioned in the review but nothing that one could consider a deal breaker. you focus too much with grammar skills and fail to do what smart people do. and that is to listen and learn. had this not been written on a website and you were to hear with your ears the dialog from the speaker would you have complained? you need to get out more and socialize with humans and stop hiding in your mothers basement playing video games. Hahahahaha…. you made me laugh so hard that i farted a little. First time ever. Martin’s English-writing quality is very high for a second language. Much higher than most Americans for sure. The days of proof-reading in news articles has gone the way of the buggy-whip. I don’t know if its laziness or ignorance but that’s the way of U.S. writing these days. And Norman, you show very little class. Agreed. Martins English is actually refreshing to my ears/eyes because so many Americans, including the media, speak and write like idiots. He often goes back to correct mistakes in articles. Thats nice to see too, some folks egos wouldn’t allow that. Hej when someone is nice about it, like pointing out where i misspelled something, then I’ll do that gladly as there is still hope that I can learn a thing or two. If someone just flames and does not provide any information besides that, well, then that someone gets ignored. I too agree with all the above. Now run, go!! Get to the choppa!! Wait til Trump becomes POTUS – there will be only curse words and sexist words allowed in any school room. Seems like tipical German Rationalism embedded in English Language. Herr Brinkmann should use more of these , ; : because reading your writing fast makes the understanding a little difficult. Perhaps Herr Brinkmann’s American editors should proofread his article(s) before publishing them to the world. If something I wrote was to be published in German (for example), I would want a German-speaking person to review the article for spelling/grammatical errors and general “readability”. In this article, Martin says, “…right from the get go is that it is not compatible only with Windows 10, but also …” the words that lead me astray is “not compatible”; if the utility is NOT compatible with Windows 10 or previous editions of Windows, then why would I want to use it? I think he left out the key word: “only” which should follow the “not” in his sentence. If you don’t like Martins English look for a different site to get your information. Or you can help out and politely correct his very minor mistakes. @ Norman: why can’t you help Martin out and show some comprehension for someone who is writing in a foreign language ? But maybe you are only a troll who needs attention. Well, be happy you got some. Have a rainy day. Martin, thank you for your excellent work. It’s truly sad how low this site has fallen. Alas “führer” Brinkmann has an army of devout followers. Did you chew on your electric blanket again ? I like this site alot! If you hate it why come in here? It’s a free blog, guy. The individual who calls himself “Norman” is either a xenophobic troll or an arrogant, immature, acne plastered High School drop out who is too dumb to realize his German is so poor as the word “führer” should be capitalized. I agree with Zoey Barkow: you’ve got some major growing up to do. The only thing disgusting is you. Seems Norman iz pro trawl. Go grab your popcorn people ! The program looks promising, tested on my laptop Windows 10 Pro, no issues so far. Thank you for the news Martin! Good article, Martin. I think I’ll check it out. Thanks. Hey Martin, dass du bei so einem Unsinn so ruhig bleibst finde ich klasse. Du hättest den dämlichen Kommentar von Norman auch einfach rausfiltern können. As always thanks for your good work Martin! Jürgen Klopp’s english isn’t perfect either, but he does get results.